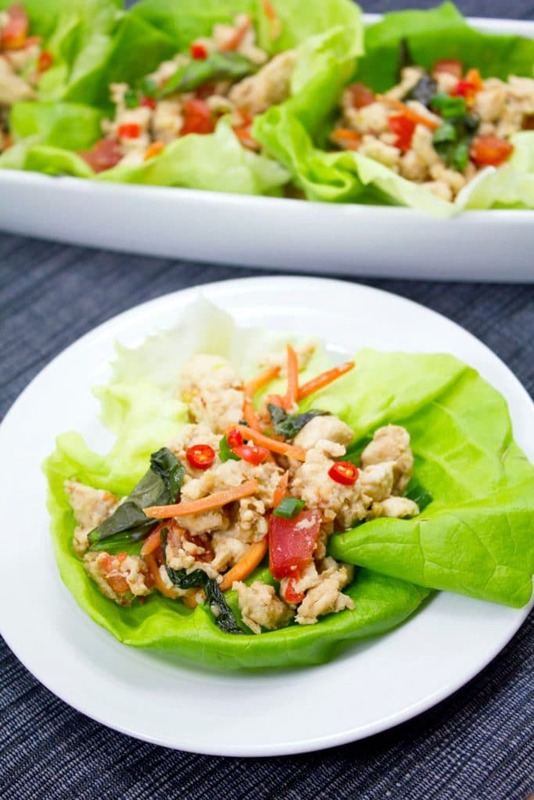 If you love Thai food and are trying to eat healthier, skip the take-out and make these Thai Chicken Basil Lettuce Wraps at home! They’re low carb and packed with flavor, with a spice level that can easily be adjusted according to your preference. I could eat Thai food non-stop starting now and ending never. It’s a habit that has the potential to get so out of control that I’ve had to resort to learning how to make as many Thai dishes from scratch as possible… Or else, I’ll get take-out from the Thai place down the street every night of my life. And to be honest, ever since I left Brookline, it’s tough to get good Thai food. The “burbs” I live in only has one place that delivers and it’s not exactly top-notch. But it’s certainly better than no Thai food at all. But let’s be honest, while restaurant Thai food is generally delicious, it’s also not always very healthy. It tends to be a bit oily and is often low on vegetables. So, making Thai food at home is the best option for getting your Thai food fix and keeping things healthy. So, I make Beef Basil at least twice a month and spend a lot more time fiddling around with new Thai recipes. Trying to make them as healthy as possibly; no MSG and all that jazz. Not that I would know where to get MSG if I wanted it. This recipe for Thai Chicken Basil Lettuce Wraps is one of my favorite weeknight meals because it’s a snap to put together after a long day at work. And it’s healthy, too! You’re probably thinking, butriceiwththaifoodissoooogood. I know. Trust me, I know. But on the next warm day of spring, sit out on your patio or deck (or OK, open a window in your apartment; that’s what I’ll be doing) and tell me a lettuce wrap isn’t way more satisfying than rice. Maybe? Kind of? At least humor me. You’ll feel better later. But really, if you’re feeling that it’s lacking carbs, feel free to replace the lettuce with rice. I won’t tell anyone. There are some nights that carbs just have to win over lettuce. Another option is to add a little rice to the bottom of the lettuce wraps to get some extra “bulk” while keeping the crisp freshness of the lettuce. And anyway, I do promise you that the protein combined with the spice of the peppers, the freshness of the basil, and the crispness of the lettuce will satisfy you more than you expect. It’s all in the spice, baby! Spicy Thai chile peppers make everything better. Everything. But also note that it’s all about the seed. If you’re not a huge fan of spicy food or you’re dining with someone who’s a bit spice-sensitive, just make sure you’re cleaning all of the seeds out of the peppers before cooking. The seeds are where a bulk of the heat is at. I love spicy Thai food, but can only handle so much. My husband? He has no limits when it comes to spiciness. If you can’t please all of your dining guests, just get out the bottle of Sriracha! That should make all your spice lovers happy (though my husband recently acted surprised that sriracha was known as a “spicy” condiment LOL). 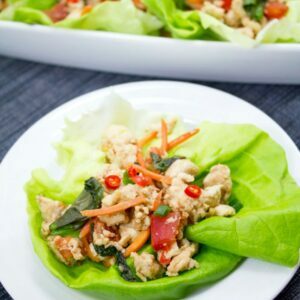 These Thai chicken basil lettuce wraps are a healthy low-carb meal that should be able to satisfy everyone! Do you like your Thai food spicy or mild? If you’re looking for more Thai recipes, be sure to check out my Thai Beef Basil with Coconut Rice (yay carbs!) or my Spicy Thai Chicken Drumsticks. 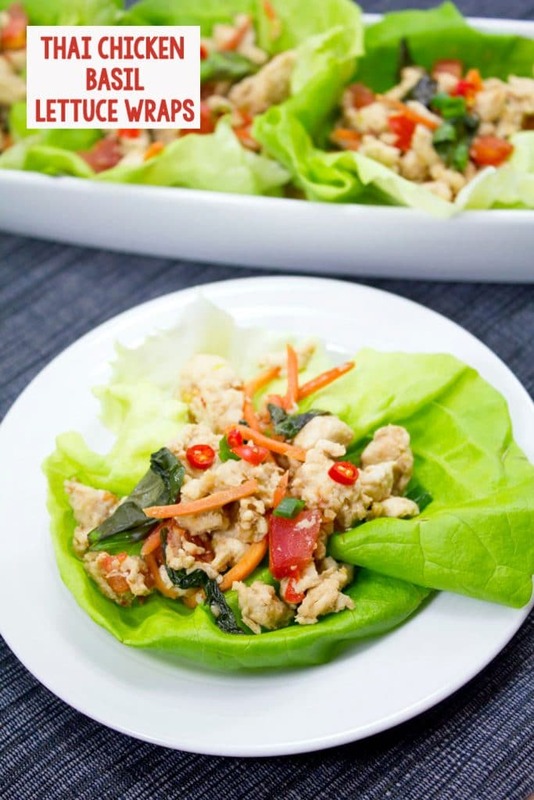 If you love Thai food and are trying to eat healthier, skip the take-out and make these Thai Chicken Basil Lettuce Wraps at home! They're low carb and packed with flavor, with a spice level that can easily be adjusted according to your preference. Combine fish sauce, soy sauce, and sugar in a small bowl and set aside. Heat a large cast-iron skillet or wok over high heat, add oil, and toss in the Thai chilies and garlic. Cook for about 30 seconds. Turn down the heat to medium-high and add the chicken, breaking up with a wooden spoon and cooking for about 5 minutes, until chicken is almost cooked through. Pour in the soy mixture and cook for 30 more seconds. Then add in the basil, carrots, and tomatoes and cook for about 30 more seconds, until basil begins to wilt and tomatoes are warmed through. Stir in scallions. Spoon chicken mixture into individual lettuce leaves. 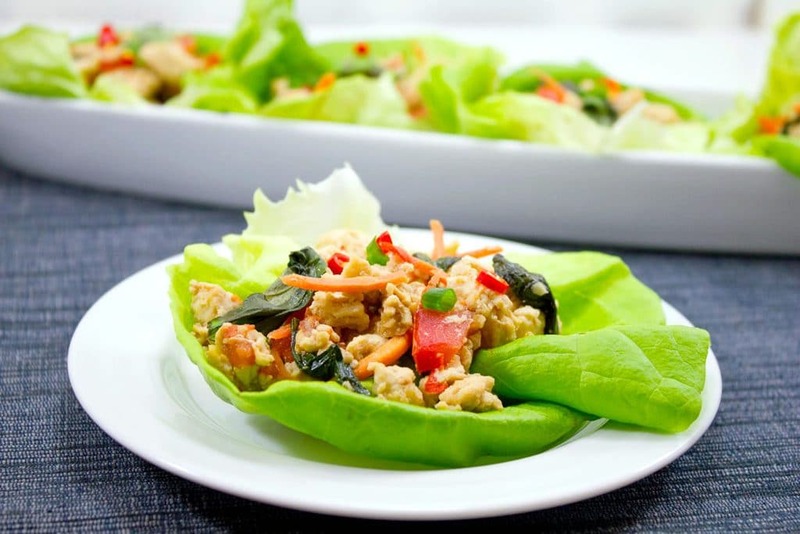 9 Responses to "Thai Chicken Basil Lettuce Wraps"
oooh these look fabulous! I love lettuce wraps! These look delicious! So cool they’re in Parade. love thai as well, and these look so fresh and tasty!! I love lettuce wraps. I keep trying to recreate PF Chang’s but to no avail… though I get pretty tasty results regardless. I love Thai food as well. It’s my mission to start making Asian food at home. I make stir-fry a lot but that’s the extent of it. These lettuce wraps look so good! Beautiful and tasty lettuce wrap, I like the basil with chicken filling…yum! umm, these look amazing. so fresh & delicious! I used to live in Thailand and found the cookbook “The Original Thai cookbook” by Jennifer Brennan to be one of the more authentic but not drive-you-crazy-with-ingredients. Which is important because I have no Thai delivery either. I feel your pain, see if you can try the book! Lettuce wraps are always fun and these look really good!